I’ve been sharing what I was up to while I was stranded at the home of some friends for eight days during last week’s major snowstorms. Part I, Part II and Part III are already online. A fellow geneablogger encouraged me to record my story and I’m posting it in the hopes it will spur others to do the same. 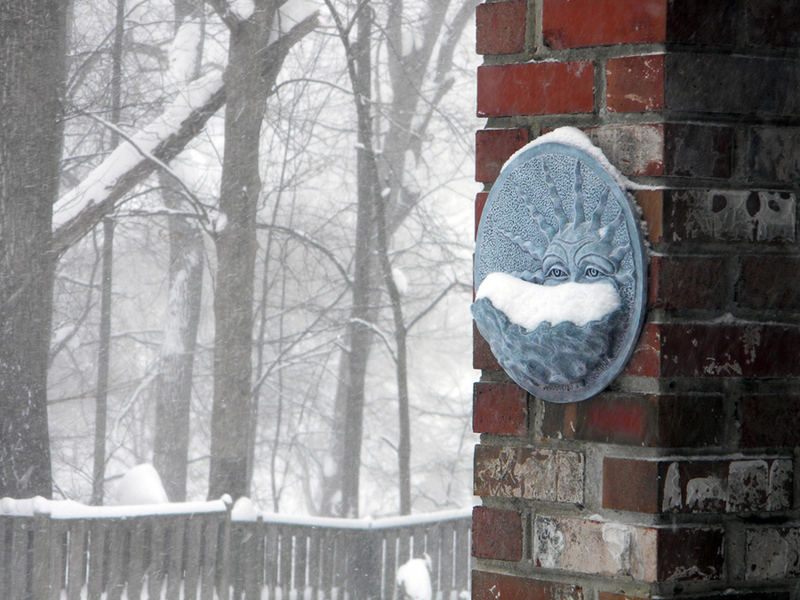 I’ve also posted tips on how to preserve and display your snowstorm photos and stories. Thursday morning was bright and sunny. Paul was up early to report online to work. I rose to join him in the living room while I ate breakfast and finished up a report for a client. We were glad to see the plows arrive promptly this time — a large and a small frontloader worked in tandem to clear the street. Around noon, I ventured outside to begin clearing the snow off and around my car. 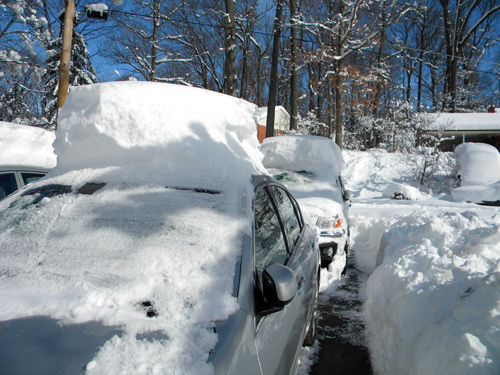 It had become clear that I wouldn’t be able to move the car without unearthing it from a four-foot snow drift that had formed on the passenger side. I had almost cleared up to the front tire by the time Sherri called me in for a lunch of grilled-cheese sandwiches (it was the first time I’d had them prepared in the oven — they were quite crunchy). I’d had to field a press inquiry for my university job while I was out shoveling and I was online for a couple of hours while I monitored that and talked to a couple of genealogy clients. Then I had a conference call regarding a conference I help promote. Close to sunset, I went back outside to finish clearing around my car and to help Paul shovel out the rest of the driveway. I was glad to see that the plows had cleared down to the pavement that morning. Dinner that night was late because Sherri was working hard to clear snow from their back deck before it began to melt too close to their basement. We finally sat down to shrimp fettucine and salad. I was starving after all the exercise I’d gotten from shoveling. I had two servings. We settled in to watch another episode of American Idol (taped) and then had more brownies and ice cream while we watched the late-night news. We couldn’t believe the reports that we may be due for more snow on Monday [that would be today, by the way], but at least they were saying that accumulations should be limited to a few inches. Kara, Kyle and I stayed up until midnight watching an episode of “Criminal Minds.” Really. It’s a creepy show. I got up at 8 a.m. and finished a transition of my business emails to my Gmail account — one of the projects I undertook with all my free time. Then I had a quick breakfast of a mini-bagel with cream cheese and tea. I was getting antsy to leave for home now that the roads seemed clear. Around 9:15 I began packing up my belongings and loading them into the car. I said goodbye to Sherri (Paul had left for work that morning and the kids were still in bed). It took me a while to maneuver my car out of its snowy encasement. Eventually I was able to back out of the driveway after a bit more shoveling and some directional help from Sherri. I quickly learned that not all roads had been cleared as well as ours. At the top of the hill that leads out of the neighborhood, I was faced with a very slushy road. I carefully maneuvered down one street and then another. When I came to Sherwood Forest Drive, there was so much snow and slush built up in the intersection, I didn’t think that I could make the left turn I had been planning on. I turned right instead and first came upon a mail truck that I had to pass. The channels that had been plowed were barely wide enough for two cars and I had to pull over to let a pick-up truck pass me before I finally cleared the worst of the slush and emerged on Randolph Road. There was a huge pile of snow blocking my view of oncoming traffic and I had to very slowly pull out onto the road and then make a U-turn before I was finally in the direction I meant to go. New Hampshire Avenue was at a crawl. It was down to two lanes up until White Oak. There were no sidewalks available to pedestrians and many people were walking in the right-hand lane (when it was clear) to make it to bus stops and businesses along the road. It took me an hour to reach the Beltway from Sherri’s driveway (normally a 10- 15-minute drive). In fact, roads all over the D.C. area were gridlocked for much of the day. My car seemed to be really sluggish and while it idled at a light I felt it hiccup and was afraid the engine was about to die. I knew once I got to the highway and could maintain a higher speed it would shake off the sluggishness — it just seems better tuned to highway driving after my long commute over the past few years. Luckily, I made it to the Beltway ramp after a torturous wait at many stoplights. I was thrilled to see open road. Dry road. My car struggled to hit the speed limit but after several minutes seemed to be back to normal. It was smooth sailing all the way to Easton. I got stuck behind a delivery truck as I made my way down Washington Street, which was pretty clear, but wet from melting snow and ice. The side streets were a mess as I pulled into my neighborhood. I had peeked down an alley that intersects the one behind my apartment and was glad to see it was down to a couple of inches of snow and ice (considering town plows never make it onto the alleys, this was better than could be hoped for after more than two feet of snow). I was relieved that my car was able to pull into my alley and I slowly approached our parking area. The car slid around a bit in the snow behind a neighboring house. I was doubly relieved to see that, as promised by my landlord, my parking spot had been dug out. My car barely made the turn into the spot. I sighed with relief when I was finally able to shut off the engine. My door could only open a few inches due to the piles of snow on either side of the car. I just managed to squeeze out of the driver’s seat. Luckily, the apartment was spared any snow-related damage and the power appears to have stayed on while I was gone. Even my plants had pulled through after 8 days of neglect. I immediately turned up the heat, made a cup of tea and heated up some lasagna for lunch. After a hot shower, I pulled on my pjs and spent the rest of the afternoon listening to plows in the hospital parking lot across the street as I responded to emails and worked on client projects. It felt so nice to be home. Snow Bound by Harry Mazer (1979) — a teenager and his girlfriend must survive in a blizzard after their car becomes stranded in a snow drift. Snowbound in Hidden Valley by Holly Wilson (1971) — a young girl becomes lost in a snowstorm and is taken in by a Native American family until the blizzard passes and she can return home. Attack of the Deranged Mutant Killer Monster Snow Goons by Bill Watterson — Calvin and his tiger side-kick Hobbes must evade snowmen gone bad, among other wintry perils. These past few days, I’ve been sharing what I was up to while I was stranded at the home of some friends for eight days during last week’s major snowstorms. Part I and Part II are already online. What I had seen of the roads scared me and I made the decision once again to stay put despite the forecast of up to a foot of more snow to start on Tuesday afternoon. I didn’t think my car would make it out of the neighborhood and news clips showed that even the Beltway was down to one lane in many places as plows struggled to clear the roads. I did start my car for a second time (I had run it for a while on Sunday while we cleared out the first round of snow). I went inside for a moment to send an email and about an hour later remembered that I left my car running. Doh! Sherri cleaned the spoiled food that remained in their refrigerator and I helped document what had been ruined for insurance purposes. Sherri’s brother returned with her father to set up and test the generator. Paul was remotely on-duty for his job. Kyle had returned home earlier in the day. He and Kara had their hands full minding two young cousins who had accompanied Sherri’s brother to the house. I had received and was responding to several inquiries from potential genealogy clients in addition to keeping tabs on emails about my work at College Park. Sherri and I ventured to the Giant at Colesville Shopping Center to stock up on food before the next storm. The parking lot was madness — snow and cars everywhere. We were lucky to spot a woman loading her car with groceries. She smiled at us and waved when she realized we’d be taking her spot. As we got out of the car, we chatted with a family who was loading their van with groceries as well. Their teenage son offered us their cart (the half-sized kind) saying that there weren’t any available in the store and warned us that one of us should get in line while the other shopped, to save time. The store was mobbed and many things were out of stock including eggs (not surprising) and grapes, of all things. It took about 90 minutes to complete the shopping trip, but it could have been worse. Most shoppers were being courteous to each other. As we neared the end of our list, I took that teenager’s advice and got in line while Sherri finished the shopping. We did not find batteries, which was dismaying. We returned to restock the fridge. Sherri’s brother, his kids and her father left as the first flakes began to fall (again). Dinner that night was marinated pork tenderloin, baked potatoes, green beans and French bread. We opened the last bottle of wine (Zinfandel) and cursed the fact that we hadn’t thought to pick up more booze while we were out. We watched American Idol in the basement after dinner. I took the dog for a quick walk around the court at some point during the evening. The winds were fierce and we constantly feared that the power would go out again. We awoke to several inches of snow on our cars and the ground (again). The winds had really picked up and snow was blowing in drifts in addition to coming down from the sky. Sherri was trying to do as much laundry as possible before the power went out again. The power did go out around mid-morning for about 15 minutes before it was restored. It went out again a couple hours later. I called PEPCO and got a live person on the line who said they were aware of the outage and were working on it. It was restored in a couple of hours, thankfully. We had relit the gas fireplace and were sitting in the living room again. We didn’t even notice when the power came back on until Sherri walked into the kitchen and noticed that the light over the stove was on again. We tentatively rebooted our laptops and started more laundry, but were comforted by the fact that we could at least hook up the generator for heat if the power went out again for an extended period of time. Even still, the generator would only last for about 13 hours before it ran out of gas, so it would be a temporary comfort. The snow tapered off around 7 p.m. Dinner that night was flank steak and potatoes. We had brownie sundaes a bit later for dessert. I worked on client research and watched the first episode of Faces of America in one room while Kyle and Paul watched basketball. Later that night, Sherri discovered that water was leaking above a window in her and Paul’s bedroom — it appeared the heat of the house was melting the snow on the roof and it was leaking down into the room. Paul went outside to knock snow off that section of the roof with a tool used to clean their pool. I took Louie for another walk during all the commotion — he could no longer make it off their back deck to relieve himself and so walking him was the only option. It was still really windy and a gust took my breath away as we tried to walk around the court. There was about 8 inches of fresh snow on the ground and the wind was blowing it around in drifts. A large limb blocked the neighbor’s driveway. Louie and I unearthed it — he was quite silly, trying to tote around a tree limb larger than he was. I had to grab it back from him before he tried to carry it between the line of cars in the driveway — there was no way it would fit. Later that night, Kara and I watched TV in the room off the kitchen — “Criminal Minds” is a creepy show. 2/15/2010: Part IV now available. Yesterday, I posted the first in a series of write-ups of my time during last week’s blizzards, when I was stranded for eight days at the home of friends of mine. We lost power several times, including a three-day stint, while more than three feet of snow fell during the two storms. A fellow genea-blogger encouraged me to record my memories of being snowed in while they were still fresh. I’m posting my write-ups in the hopes that it will spur others to do the same. Earlier this morning, I also posted ideas for preserving your blizzard memories for the future. The next morning, we didn’t exactly wake with the sun, but the fact we were all awake by 8 a.m. was abnormal, especially for the teenagers. I had a bowl of cereal for breakfast and Sherri set a tray of sliced bagels on the hearth for the rest of the family. They toasted up very nicely and there was margarine or cream cheese to spread on them. Sherri’s most ingenious maneuver was to rig a s’mores maker I’d given them as Christmas gift a couple of years ago to boil water. The contraption included a grate under which you place a lighted sterno. You hold marshmallows over the grate using tiny skewers to toast them for the s’mores. Sherri placed a small tin pot full of water over the grate instead. After placing foil over the pot she was able to bring the water to a boil. This allowed her to brew hot tea for Paul, me and her. While inside the house, we mostly remained in our sleeping bags, but the kids did venture out to play in the snow, which had stopped at sunset the night before. The day was bright, sunny and cold. Paul shoveled the walk and part of the driveway and we cleared off our cars. The dog frolicked in the snow with the kids and I took lots of pictures. Some of our phone batteries were starting to run low. The kids charged theirs on the remaining juice from their laptops and Sherri and Paul used their car chargers while they warmed up the cars for a while. I was using mine sparingly and it still had a decent charge. Lunch was leftover pizza slices warmed on the hearth the same way Sherri had toasted the bagels. Cold cuts and potato rolls were available too for those who wanted sandwiches. Kyle got permission to walk to his cousin’s house, where they had heat and power. I followed him to the corner with the dog on a leash, using the path created by his footsteps. Even with the path forged for me, the snow was past my knees (and I still didn’t reach bare pavement in my boots). The dog wasn’t having nearly the trouble I was. He plowed through the snow, reminding me of a dolphin as he’d plunge into the snow, leap forward through the air and plunge back down. I stumbled several times and there was nothing I could grab onto to try and regain my balance. If I put my hand out to try and brace myself, it simply sank into the snow. Once we reached the corner, I was relieved to see that someone with a snowblower had cleared a path down the street about 3.5 feet wide. It was nice to walk around the block and stretch our legs. Later, we watched a neighbor in a 1960s Ford Bronco rigged with a plow blade try to plow our court. We still had not seen a county plow or a PEPCO truck. The Bronco got stuck in my friends’ front yard and it took several guys to dig him free. Dinner was barbecued chicken. I made mine into a sandwich. Sherri and Paul figured out a way to cook frozen hash browns on a cookie sheet on the grill. We found a package of chocolate-chip cookies for dessert. Another bottle of wine was opened (Riesling this time). Sherri rigged curtains across the living room doorways, which helped trap the heat from the fireplace. Kara found an old battery-operated radio of hers and Sherri located batteries for it. We listened to updates about the snowstorm around the region. Washington, D.C. initially decided to open schools two hours late on Monday, but then recanted after many complaints from teachers and parents. We listened to periodic updates about the Superbowl, which we weren’t able to watch. We were happy to hear the Caps kept their winning streak going. Despite the fact we still didn’t have power, we all managed to stay nice and toasty and this time everyone slept in the living room (except Kyle, who stayed at his cousin’s house). The rest of the house was in the 50s. Once again, we were all snuggled into our sleeping bags and blankets by 9 p.m.
We awoke around 8 a.m. again and decided to leave the curtains enclosing the living room open in order to let some heat into the rest of the house, which was now in the 40s. Sherri and Paul feared that the pipes for their water-fed baseboard heat would begin to freeze soon. The living room quickly cooled off despite the heat from the fireplace. We were reluctant to use the last Sterno to heat more water for tea — we weren’t sure how much longer we’d be stuck. Without the hot beverage it was harder to keep the chill at bay. I showered for the first time since the power had gone out. Luckily, the house still had hot water thanks to the gas water heater, but I had delayed the shower because I detest exiting a hot shower into cold air. At first, it wasn’t as bad as I thought it would be. I pulled on long-johns, jeans, a long-sleeved t-shirt and a wool sweater. I sat in front of the fire place while I waited for my hair to dry. I soaked up a lot of heat while in front of the fire, but couldn’t manage to hold it in, even after crawling back into my sleeping bag. At this point, uncaffeinated and unable to shake off the chill, our situation was starting to take its toll. I curled up completely inside my sleeping bag and prayed for the power to be restored soon. Or at least to see a plow (a real one, this time). Miraculously (finally! ), a plow made its way down the street that led to our court a short time later. It managed to clear the road past our driveway, but then it got stuck in the neighbor’s yard. It took the arrival of another plow to free the first. Sherri contacted other relatives in the area who also still had power and heat. She negotiated to have Paul drive me and Kara over to their house to warm up now that we could get out of the neighborhood. 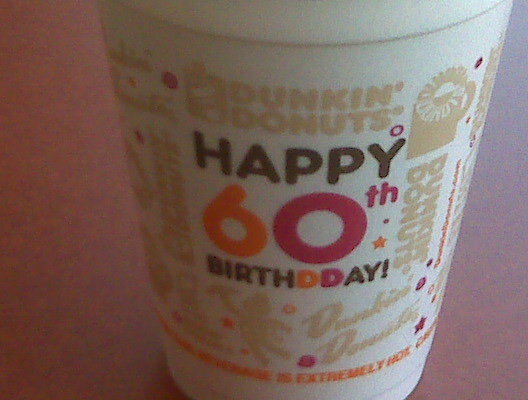 Paul, Kara and I ventured to Colesville Shopping Center first to pick up breakfast sandwiches and hot beverages. The roads were still quite a mess. The plows hadn’t managed to reach bare pavement anywhere and had only cleared one lane on all of the streets — there was only room enough for one car at a time. Thankfully, Paul was driving a four-wheel drive SUV. Still, our first attempt out of the neighborhood was foiled by a wood-chipper dealing with a felled tree. After our trip to Dunkin’ Donuts, we passed streets near my old elementary school that still hadn’t been plowed. Many cars were left by the school and folks walked to the homes of their friends and families from there because they couldn’t go any further. Another section of road was completely missed by the plows and we later learned that this was because of a downed wire. A Honda Element was stuck in the snow at the entrance to the unplowed area and someone had scrawled “Please Plow” on a large piece of ceiling tile stuck in a snow drift. We managed to get to Dave and Susan’s and their heated house was such a nice sanctuary. Kara, Susan and I snuggled under blankets and watched HGTV while Kara and I ate our breakfast sandwiches and drank our tea and hot chocolate. Kara and I had brought our phones and computers. We were able to charge them back up and make use of Dave and Susan’s wireless. Later, Susan served us hot tea and chips and salsa. Their oldest daughter will be getting married later this year and we got to see where she and her beau will spend their honeymoon. I also talked social marketing strategy with Dave who runs a real-estate business that is venturing onto Facebook. We all cringed at the news that more snow was on the way the next day. Paul and Sherri had to stay at their house with the animals and to keep an eye on the pipes. They came to Dave and Susan’s around dinner time with pasta from Pizza Hut, salad and soda. Susan made rum and Cokes (with generous shots of rum, bless her). Their big news was that Sherri’s brother was bringing a generator that at least could be hooked up to the house to run the heat again. Paul returned to the house to meet him. Soon after he arrived he called to report that while we were eating dinner with Dave and Susan, power had finally been restored. Hooray! He came back to fetch Sherri, Kara and me. That night, we were able to sleep in our own beds again. 2-14-2010: Part III now available. 2-15-2010: Part IV now available. As I write this post on Friday night, I recall a mention on the news that today, every state in the U.S. will have snow on the ground. I have my doubts about Hawaii, but I know here in Maryland that’s certainly the case. I took tons of pictures during the snow storms we’ve had here over the past week. I also took some time out today to write up my memories of the past eight days or so. The recent storms have been record-setting and won’t soon be forgotten. Many years from now, we’ll be reminiscing about the power outages, sledding, shoveling and cozy fires. Take some time to record your memories before the details slip away. I’ll be including my photos and write-up as part of my 365 Project. You probably have dozens of pictures on your camera or laptop right now. Take some time to get them into a scrapbook soon and include notes about what you did during the recent storm(s). What did you eat? Did you lose power? How did you cope? Years from now, you’ll get a kick out of re-reading your notes and seeing the photos. You’ll be glad you took the time to preserve these snowy memories. Use Creative Memories’ 8×8 Winter Wonderfland Picfolio Quick Kit to display your printed photos quickly. This all-in-one package includes the album, paper and embellishments you’ll need to tell your story about the Blizzard(s) of 2010. Digital scrapbookers might like Creative Memories’ Cozy Winters Digital Kit paper and embellishments for their digital pages. Download all you need straight to your computer. Commemorate the historic snowfall with a mug, poster, t-shirt or page print using CM’s Digital Center* and your own photos. As those who follow me on Twitter and Facebook know, I was stranded at the home of some friends of mine for eight days during this month’s two major snow storms. We lost power several times, including one three-day stint. Despite it all, we managed to stay warm, well-fed and sane and I’m extraordinarily grateful for their hospitality in a less-than-ideal situation for all involved. I arrived at my friends’ house at about 10 p.m. on Thursday, Feb. 4, after working late that day. I did not sleep well the night before and had negotiated to spend the night so I wouldn’t have to drive home while sleepy. I was due back in College Park for work at 7:30 a.m. and had planned to stay at my friends’ place on Friday night anyhow so I could attend a workshop in DC. I don’t know how I found the energy, but I stayed up with them until about midnight. I awoke early on Friday morning to hear that the College Park campus was not going to open, in anticipation of that day’s storm. I went back to sleep and awoke again at 9 a.m. to see the first flakes falling and learned that my Saturday workshop also had been cancelled. I made the decision at that point to stay at my friends’ house for the duration of the storm. We hadn’t seen each other in a couple of months — we had Xmas presents to exchange along with catching up to do in general. The idea of being snowed in with them for a couple of days sounded fun. I had no idea what was really in store weather-wise. That day, we watched the snow fall, played on our computers and got ready to settle in for a couple of days until we could dig out. My friends’ daughter, Kara, had one of her friends over for part of the day. Kara begged to be able to spend the storm at her friend’s house, but her mom, Sherri, wisely insisted on having both of her kids stay home. She wanted to know they were safe and desired “family time.” This would become a running joke. Sherri and I took their dog Louie for a long walk around the neighborhood in the snow late in the afternoon. We saw two deer and luckily Louie didn’t try to bolt after them. We ate frozen pizzas baked in the oven for dinner and then watched TV together and opened Christmas presents. It was nice and cozy. All seemed to be going well when we awoke the next morning. Several inches of snow had fallen overnight. At 11 a.m., as Sherri started a load of laundry and I was settled in to check email, the power went out. This is a common occurrence in their neighborhood (incidentally, the same neighborhood where I grew up). There are many, many trees with dangling limbs and overhead power lines that are very susceptible. We all moved into their living room, which provided plenty of light thanks to a huge picture window onto their front yard. I dubbed the occasion “Extreme Family Time” in response to Kara’s complaints about being stuck in a house without power while her friends still had lights and heat. I updated my Facebook status with news about the power outage and received many comments from friends hoping the power was restored soon. This was not to be. As the house began to cool without the heat running, the gas fireplace in the living room was turned on. I powered down my laptop to save its battery and grabbed a book, settling in on a loveseat in the living room. Sherri tried to call PEPCO, to alert them to the outage, but their phone system was so overrun, she only heard an automated message stating their mailbox was full and they couldn’t accommodate any more messages. Not good. I periodically checked my Blackberry for emails as I read chapters in my book. Many other friends in the area reported being without power. What did we do before we could access the Internet on our phones? I shudder to think about it. The snow was very deep already in our neighborhood and venturing somewhere with power wasn’t really an option. The kids begged to go outside and play in the snow but Sherri wasn’t having it while the storm continued. 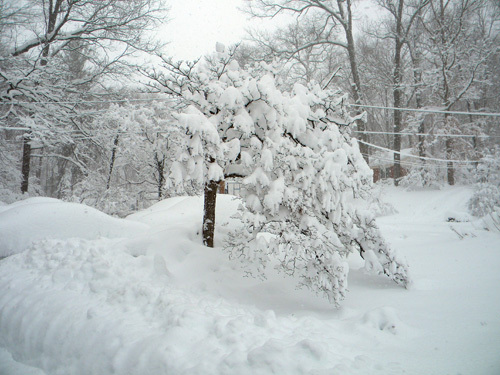 The snow was very heavy at times and was already weighing down many tree branches around the house. Their half-feral indoor-outdoor cat was going stir crazy and was not allowed outside either, leaving our legs and the furniture in peril from his claws. As it became clear that power would not be restored very soon, we started to get ready for the dark. When we needed to move around the house, we used tap lights or an LED flashlight to see. Most of us tried to flick the light switch as we entered the kitchen or the bathroom, out of force of habit. The food in the refrigerator was quickly starting to warm up so we moved what we could to their unheated garage. We buried the frozen food in the snow on the back deck. The grill out back was uncovered and my friend’s husband Paul cooked burgers and hot dogs on the grill for dinner. We finished off a bottle of wine (Merlot) that had been opened the night before and ate ice cream for dessert. We gathered together the family’s sleeping bags. By 8 p.m., we were in bed — there was simply nothing to do once the light outside waned. I was on the loveseat, Kara was on the floor in front of the fireplace and Sherri was on the couch. Their son Kyle insisted on sleeping in his bed at the other end of the house. Paul slept in the basement, which was still kind of warm, being mostly underground. In the middle of the night, Kyle came out to the living room where it was warmer. 2-13-2010: Part II now available.